Hello crafty friends, I wanted to share a quick card with you today using The Greeting Farm Joy stamp set. This stamp set was sent last month as apart of The Greeting Farm super secret stamp club. I totally forgot about this stamp set as it was buried under other stamps on my desk. I am pretty sure we have all been there where you place something on your desk and then it gets buried under other goodies. Well I was excited to find her, it was like Christmas all over again. Since I am in the valentines making mood, I decided to make a valentine's card using this cute stamp. I stamped the image out on copic x-press it blend card stock using my favorite things hybrid black ink. 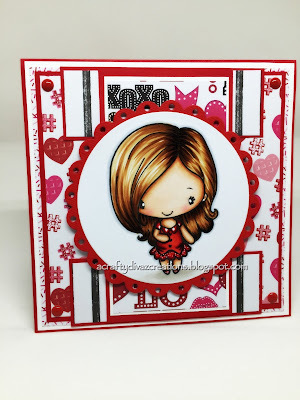 I used my copics to color her up and die cut her out using a lawn fawn stackable circle die. I layered a fancy scalloped circle die cut from Lawn Fawn behind her to give her some additional detail. I used designer papers that I bought from my local craft store. Well that's all I have for now, I would appreciate it if you leave a comment. Let me know what you think about the card. Make sure you stop by tomorrow as I will have another card share for you. Have a happy crafty day! WoW, what a stunning card you made :-)) I like your beautiful colouring. WOW WOW WOW this is super stunning work. I love your image and you have coloured her to perfection too. Great work, love it. Great coloring. Thank you for sharing with us over here at "A Perfect Time To Craft" and best of luck with your entry. Beautiful card - your coloring is gorgeous and that image is so sweet with these papers!